Slots Hall Casino is rapidly becoming one of the hottest and most popular online casinos for South African players. The casino accepts payments in Rands (ZAR), something that South African players love. There are over 300 amazing RTG games to choose from, mouth-watering promotions, great payment support and excellent customer support. At the core of all this brand new casino is software from one of the best in the business, Real Time Gaming (RTG). Slots Hall Casino runs on software from Real Time Gaming (RTG). This is an automatic guarantee of high quality gaming, given that RTG is considered to be among the best in the business. The games load quickly and gameplay is smooth. The games come with exciting graphics and there are some great games to try out, including a few massive progressive jackpots totaling over R33 million at the time of writing. There are cool features like floating bonus symbols and the cool Win-Win feature, along with the random trigger for the progressive jackpots. The game range is extensive – over 300 great games – and includes a superb selection of slots, table games, video poker, progressive jackpots and specialty games. The slots are themed across multiple popular subjects and you get to play classic 3-reel slots, 5-reel and 6-reel video slots and progressive slots as well. There are the amazing Real Series slots to check out as well. Exciting slot titles here include veterans like Eternal Love, Count Spectacular and Cleopatra’s Gold along with newbies like Plentiful Treasure, Fire Dragon and Stardust. Slots Hall Casino On Mobile - Play Anywhere, Anytime! All the bonuses and promotions at the SlotsHall desktop casino are available to players on the mobile casino as well. 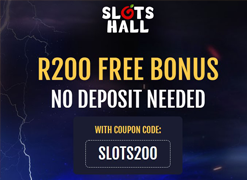 When you sign up through our site you get the exclusive R200 no deposit bonus to start your journey here, and the welcome bonus of R20,000 + 50 free spins and other bonuses as well. The no deposit bonus can be redeemed here too using the coupon code SLOTS200. The Cashier is compatible with the mobile platforms ensuring smooth and easy payments and withdrawals. The game portfolio is limited at the mobile casino compared to the desktop casino. You get 120+ games, most of which are slots. You get to play some cool progressive jackpots as well, along with a smattering of table games and some video poker games as well. Popular slots here include Samba Sunset, I, Zombie and Caesar’s Empire, among others. Windows Phone: Microsoft Lumia 550, Microsoft Lumia 650, Microsoft Lumia 950, Acer Liquid series. Slots Hall casino is reliable, safe and secure. The games are great and available for both practice play and real money play. There are exciting promotions to take you along and you also get to pay in Rands. The casino is operated by Sea Gate NV and licensed by the Government of Curacao. The use of RTG software is a guarantee of good gaming and we have no hesitation in recommending this casino to South African players. So go on, Sign up with SlotsHall Casino now for a memorable gaming experience! Game Variety: Video Slots, Blackjack, Roulette, Baccarat, Video Poker, Keno, Scratch Cards, and other arcade games. Deposit Options: Credit cards from Visa, MasterCard, American Express and Diners Club International, Visa debit cards and eVouchers, NETeller, Skrill, EcoPayz, EasyEFT, EFTpay and Bitcoins. First Deposit Bonus: 200% up to R10,000 + 20 free spins with coupon code WELCOME1. Second Deposit Bonus: 150% up to R10,000 + 30 free spins with coupon code WELCOME2. Game of the Month: 75% bonus + 10 free spins on game of the month – for March 2019 the game is Cubee – using the coupon code CUBEE75. Howzit Bru: 75% bonus on single deposit daily with coupon code HOWZIT. Hayibo: 75% bonus + 15 free spins with coupon code HAYIBO. 100% Bonus? Yebo! : 100% match bonus with coupon code YEBO100. Have a Lekker Day: 100% bonus + 20 free spins with coupon code LEKKER. EISH! What a Deal! : 115% bonus + 25 free spins with coupon code EISH115. Just Sommer: 120% bonus + 30 free spins with coupon code JUSTSOMMER. It’s Jol Time: 125% bonus + 40 free spins with coupon code JOLTIME. Rock’n’Roll Monday: 125% bonus on a deposit made on Mondays with coupon code ROCK-MONDAY. 130% bonus + 40 free spins with coupon code FRIDAY130. 160% bonus + 20 free spins with coupon code FRIDAY160. First deposit: 80% bonus + 25 free spins with coupon code SUNDAY80. Second deposit: 110% bonus + 50 free spins with coupon code SUNDAY110. Three Ways to Play: The games are available in 3 exciting modes: download, instant play and mobile casino. Free Practice Play and Real Money Play: The casino supports playing in free practice play mode, which is a great option for those looking to hone their game without spending any money on real money wagers. Progressive jackpots: There are some amazing progressive jackpots that have the potential to give you a life-changing win. The best thing about these jackpots – they are triggered randomly.